Flexible rail absorbs impact, reducing the risk of serious horse injuries. Centaur is the inventor of High Tensile Polymer HTP®. The HTP® material is a blend of impact modifiers, UV stabilizers and anti-fungicides. This specialized formulation provides added durability, as well as, stain and mildew resistance. Will not splinter, rot, rust or crack. Minimal upkeep is required throughout the life of your fence. Simply adjust tension when needed. Each rail has up to 4,200 lbs of break strength. This helps provide sound perimeter protection against possible fallen trees and roadside damage. Withstands temperature conditions from -40°F / -40°C to 200°F / 93.3°C without becoming brittle or experiencing breakdown. Centaur rail installs in a continuous length and does not need paint. Simply unroll, attach and adjust tension. When choosing the best fence for your property, there are many factors to consider. Included is information on fence safety, containment strength, cost and maintenance, ease of installation, appearance and warranty. 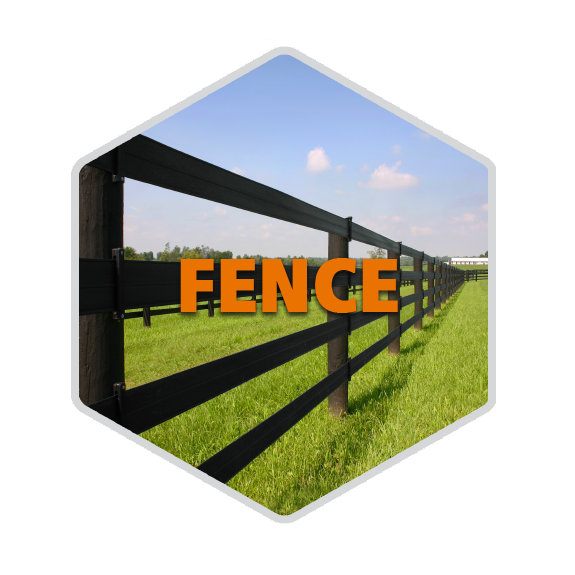 Veterinarians and horse owners recognize how Centaur®, The Horse Friendly Fence®, helps prevent both minor and serious injuries often caused by traditional fencing. Centaur rail and coated wire fencing systems, combined with exclusive accessories, provide a safer environment for horses and peace of mind for their owners. Centaur also offers KleerFlex Door®; a brilliant solution for barn, shed, workshop and rehabilitation area doorways.